Introducing Intended Flight Paths. It’s a feature which ranked high on our users’ request emails. The Intended Flight feature allows you to draw the planned path (or paths) in 2D or 3D, and compare with the flight actually flown. 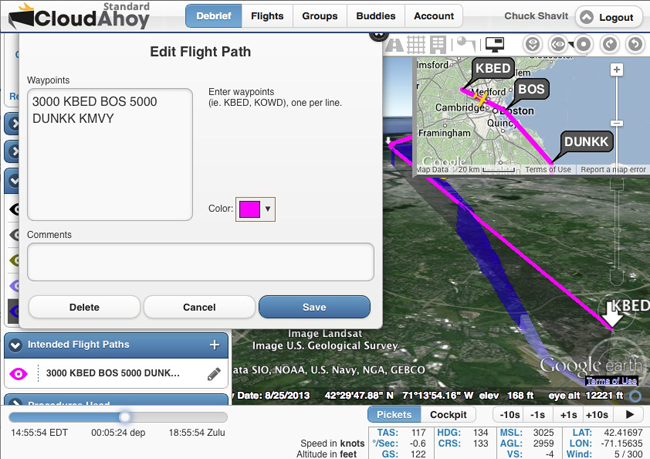 The screenshot on the right shows an IFR flight from KBED to KMVY. The flight takes off and intercepts BOS R-312, then proceeds to DUNKK and MVY. The diagram at the bottom shows an example of a 3D intended flight path on an IFR chart, with the actual flight hidden. 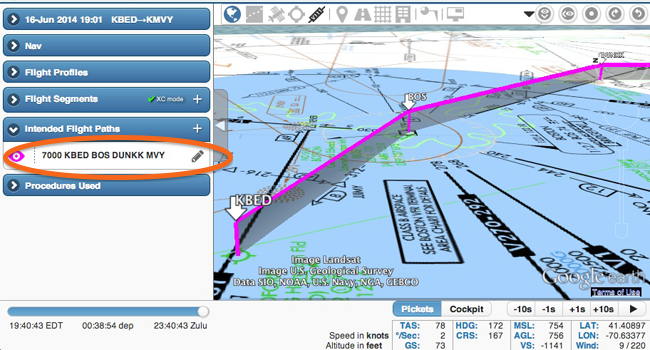 To create a path, click the “+” sign on the Intended Flight Paths banner – a new banner on the left panel of the Debrief tab – and the path editor will open. Type a list of waypoints and optional altitudes in the box, then click “Save”. Use any US fix name, VOR or airport. Numbers such as “5000″ denote altitude, and are optional. You can have any number of paths per flight, and assign each a color of your choice. You can edit paths, and you can delete them. Intended Path is available on CloudAhoy Standard. As usual, your feedback is very important. Let us know what you think.